The musical, “King Of The Whole Damn World,” opened Off Broadway in New York at the Jan Hus Playhouse in April, 1962. With a book by George Panetta, music and lyrics by Bob Larimer, it was based on “Comic Strip,” an Obie-award winning play by Mr. Panetta. The story revolves around five year-old Jimmy Potts,. With nothing better to do, the neighborhood boys have written “C-A-T” on his head. The grownups conclude this is the work of a dangerous “cat fiend.” Two incompetent cops are called in to solve the crime and chaotic confusion ensues. 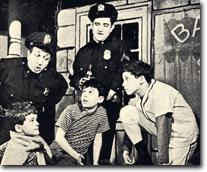 Tom Pedi and Brandon Fay played Hippo and Sarge, two New York City cops shown here grilling the neighborhood kids.